The Istanbul summit on Syria took "huge steps" toward ending its civil war, but the situation remains dangerous with so many foreign armed forces in the country, a top US envoy said Tuesday. 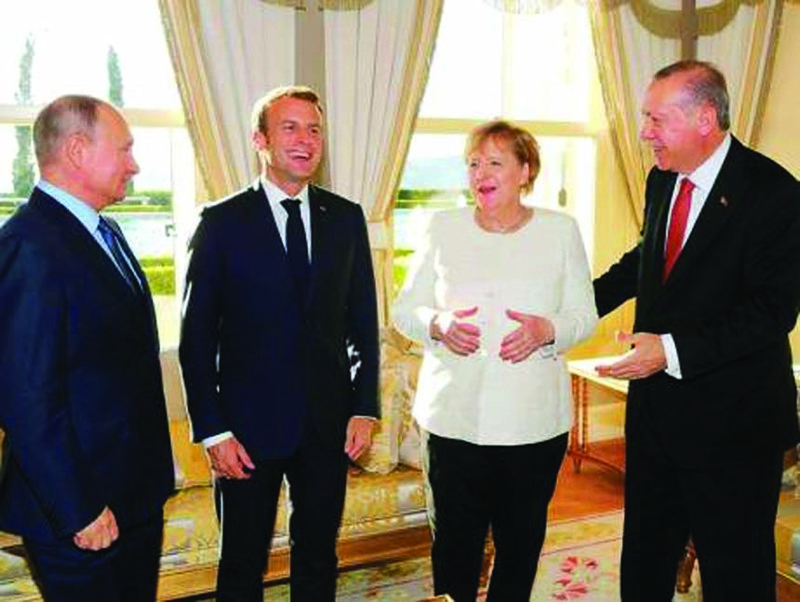 The leaders of Turkey, Russia, France and Germany met in Istanbul at the weekend and called for a political solution to Syria's seven-year war and a permanent truce in the last major rebel-held bastion of Idlib. James Jeffrey, the US special representative on Syria, argued that the United States even helped bring about the result despite its absence from the gathering. "We are very happy with the Istanbul result," Jeffrey told journalists in Brussels during a tour of European and Middle East capitals. He cited the summit's appeal for the Idlib truce to become permanent and UN envoy Staffan de Mistura's call for a committee by year-end to produce a post-war constitution. "These are huge steps forward," Jeffrey said. "These would not have happened without the United States." He added that Washington had been in contact with participants Turkey, Germany and France. He said US President Donald Trump had exerted diplomatic pressure by informing his Russian counterpart Vladimir Putin in Helsinki that the US military would remain in Syria. "We are vague on what our military would be doing there but that's a game changer," Jeffrey said. In the run-up to the summit, Jeffrey said a Russian-Turkish deal for a buffer zone around Idlib was a "major step" that has "frozen" the country's war. The agreement, reached last month, was seen as forestalling a devastating regime assault on the area, which hosts around three million people. "The good news is we now have a basically frozen battlefield," Jeffrey said, without minimising the continuing fight with the last elements of the Islamic State group. But he also warned of "real dangers" with so many armed forces present, some of whom could end up clashing with each other. "We have five military forces from the outside-Iran, Israel, Russia, US and Turkish that are now in close proximity," he said, which could lead to "armies potentially shooting at each other." He recalled for example the accidental downing last month of a Russian plane with 15 personnel on board, which has tested relations between Moscow and Israel. Meanwhile, a Syrian-led human rights group says it has documented more than 1,400 instances in which Russian forces indiscriminately targeted civilians and civilian infrastructure during three years of involvement in the Syrian civil war. The Berlin-based Syrian Archive has created a video database of the incidents, reported between September 2015, when Russia began its airstrikes on behalf of President Bashar Assad's forces, and September 2018.